Huawei announced it's top-shelf chipset, the HiSilicon Kirin 980, which brought a lot of world's firsts. What the company failed to mention were some key details about the SoC and the operating frequencies of the CPU clusters was among those. During an event in China called Knowledge-core, the spokesperson revealed the clock speeds of all eight cores. Since the CPU consists of three separate clusters, each has its own clock speed - we've got 2x Cortex-A76 clocked at 2.6GHz and 2x Cortex-A76 ticking at 1.92GHz. The final four Cortes-A55 cores are set to operate at 1.8GHz. Obviously, the high-performance Cortex-A76 cores are used only for short heavy tasks like application startup or during demanding workloads while the lower-clocked A76 cores will do the lifting most of the time along with the power-efficient A55 cluster. 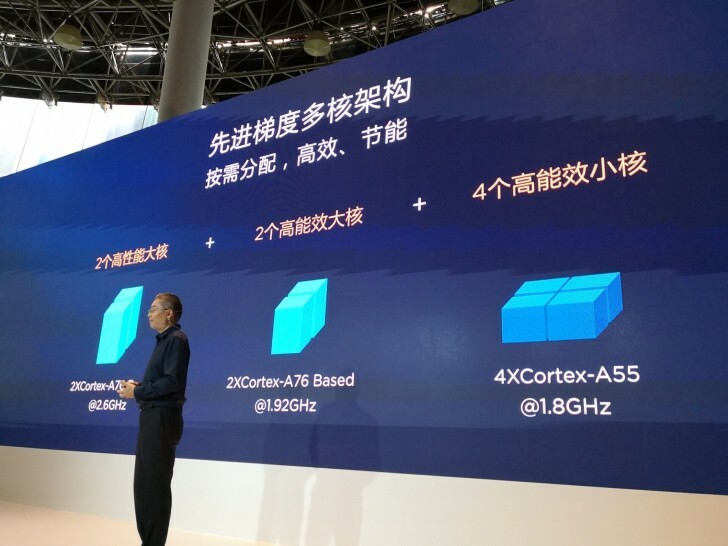 Huawei says that running all eight cores at the same time is a really rare scenario because the power consumption and heat dissipation would increase rapidly. The Cortex-A76 cores are pretty big after all and that's why the chose to split them into two clusters.